Making the most of our Roads - Pre-booked Parking. You want to go in to Brighton for the New Year Sales, you will be bringing back lots of items, so need your car to transport them. As things stand today, you set off early, you hit the traffic queues, slowly crawl into Brighton, stop/start, stop/start burning fuel, wearing brakes, emitting fumes. Eventually you get to join the long, long queue for the car park and then trickle even more slowly forwards until eventually you get through the barrier and go looking for a space. Time wasted, fuel wasted, jams caused. You txt a request for a parking space near the shops you want to visit, request a time and duration of stay. You get a txt back giving three options for available locations, time and duration. You select one, then get on with your business. Knowing that there will be no jams and a space will be waiting for you, you set of shortly before you allocated slot, driver directly to the parking space park and shop. A huge number of vehicles clogging Brighton roads are simply looking for or waiting for a place to park. They sit in queues, holding up other traffic all emitting fumes to no purpose. A solution? How about making all parking spaces in Brighton pre-bookable so no car ever waits for a space? Before a vehicle even starts its journey, the driver knows where they are going - and because the roads are clear there is no need to set off early to allow for jams. Set of to arrive just in time, as the previous vehicle vacates its space. So drivers spend less time travelling, so use less fuel, emit fewer fumes and tie up the roads less. How do you force people to use the pre-booking? You don't need to, it as long as bookings are allocated fairly everyone is better off, there is no reason/need to force people to use it. Council tax payers could be given a free allowance of parking slots, early booking could be given a discount, any person, company or organisation with parking space could allow the system to manage their space too (when they don't need it). The city has recently abandoned plans for 'Park and Ride' - but with pre-booked parking the city could implement 'Park and Park' for its visitors - instead of queueing on the city roads, wait in a holding area outside the city until a parking spaces is allocated and then drive directly to it to arrive just as it becomes available. Brightons roads would be used for their intended purpose, to let people get from A to B, not as a huge holding area for people waiting for parking spaces. Under Labour, Conservative and Greens, the council are jaded and out of new ideas they are all pretty much the same in thinking pricing is the only solution. The city needs to move away from the failed old parties and the new failed party (the Greens) and get some fresh thinking - that's me - that's UKIP. Want to work instead of get benefits? That's a criminal offence! This is a short blog to expand on a point I was making elsewhere. These events actually pre-date the Blair/Brown fiasco of a government, but I see the influences persist right thought to this day. Relying on the state is 'easy' - but if you want to leave and be independent you need a massive escape velocity, because at every turn there will be people and institutions poised to take what you have earned so far, and throw you back down into the black hole of welfare dependency. I am lucky to be in a group that, while commonly hated, doesn't go in for self-loathing. I am a normal, white, law abiding, middle class, married, male with kids. I value what freedom I have and object to any other UK citizen having less freedom than I do - I also hope (probably in vain) that those with more freedom than I have are working to expand my freedom, the evidence seems to be quite the opposite, those more free than I want to further limit everyone elses freedom. I object to being obliged to provide information that the recipient has no right to. A big issue that I have objected to for many years is 'gender' on forms. Unless someone has the 'right' to check my gender for themselves then I do not believe they should be asking me for the information. I have no gender 'issues' myself, I simply object to unnecessary information being demanded (for train season tickets for instance). It now transpires that transsexuals have a genuine specific problem with 'gender' being given on forms it can put them in awkward and embarrassing situations. Now there is discussion of allowing them to not answer such questions, or have a special category. My suggestion? Scrap the question all together - like I have suggested all along. Only your partner and doctor NEED to know your gender. If companies/organisations weren't gathering more information than they needed, this problem would never have arisen in the first place. I don't smoke (I gave up before I got married, in the 1980's). And I prefer not to be in a smokey atmosphere - however I strongly object to the bullying anti-smoking lobby - especially that part I involuntarily finance though my taxes. The bogus argument of 'protecting employees in bars' preventing ALL customers from smoking is devious, dishonest and nasty. I read that the recent 'occupy' camp in Brighton had tried to operate a 'Dry Zone' policy (which I take to mean no alcohol on site). I hope, after consideration, they will see the irony of their position. Firstly it condemns even moderate drinkers (pretty much everyone?) banning something just because a few have a problem with it is very totalitarian response - not a place I would have thought Occupy would want to put themselves. Secondly, if someone genuinely is an alcoholic why should that excluded them from the protest? Is occupy launching itself with its own class of 'untouchables' built in to its very core? People really should stick up for others while they can - otherwise when you need someone to stick up for you it may be too late. I don't remember where but someone wisely observed that sticking up for others is never comfortable - because you only need to stick up for others when they are unpopular and everyone else is against them - and so will be against you too. The government and their interference is the cause of most problems in society, not the solution. A governments only 'tool' is taxpayers money, their only control is to take more in tax and throw it at a 'problem' or not take more tax and let taxpayers fix problems themselves. The first justifies the governments existance and expansion, the second undermines it so they always choose the former. 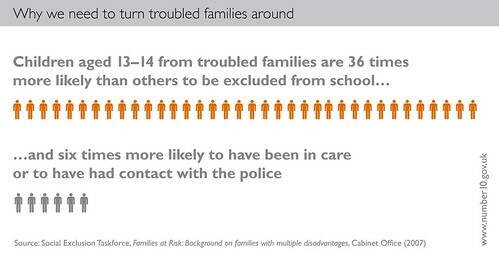 1) First a circular argument - "We need to stop it because otherwise it won't stop"
2) Another circular argument - trouble at school or with the police is part of the definition of a 'troubled family', so of course they will be more likely to have been in trouble at school or with the police. (re: being in cares see 'infographic' number 4). 3) Now we have 'estimates' based on number of troubled families within local authority area - well, unless local authority areas are all the same size this is meaningless, even if the figures weren't guesses. 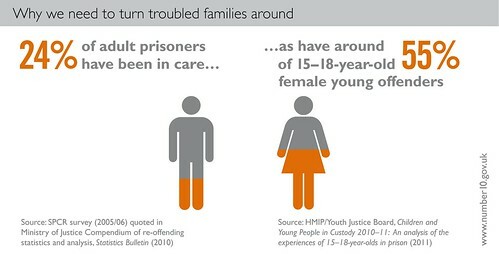 4) Being in 'care' shows more state failure. This may show one of two things, either being in care is bad for children and the state is useless as a parental replacement, or if being in care isn't to blame directly then the state took the children into care too late for any damage to be repaired. 5) Finally the governments 'solution' - throw money at it. In summary, what a waste of taxpayers money, what an insidious trick for the government to pull on the public - to justify taking tax and pretend people will be helped when they won't be. The story about Millie Dowlers voice mail deletions didn't make sense, so back in July I blogged about it and sent of an freedom of information request to the Metropolitan Police. This has finally (about six months on) got to the end of the Mets' request/review procedure, with them refusing to give me any information (or confirming/denying that any relevant information exists). After Millie Dowler went missing, her mobile voice mail became full - people leaving messages asking her to call, but not being picked up/deleted. It was reported that someone working for the News of the World had 'hacked' the voice mail to gather information about the story, it was further reported that this person deleted some of the voice mails so there would be space for new messages that may lead to new stories. At this point, Millies mother became aware that messages had been deleted, so took hope that Millie herself had picked them up, and so must be alive. This, unfortunately, was not the case. I was surprised that the police had not traced the caller who deleted the message, so put in an FOI request regarding this. Subsequently it has transpired that at the time of the voice mail deletions, News of the World had not yet engaged the man responsible for the hacking claims against them - so it was not him who deleted the messages. Now it is being suggested that it was the police themselves who caused the messages to be deleted! I don't think my (refused) FoI request is unreasonable, and a reply would have shed light on this long ago. So I am left wondering if the Metropolitan police actually have a different, undisclosed, reason for refusing my request and taking so long about it. I was given a copy of Labours election leaflet for Brighton and Hove City Council - Westbourne Ward. I was gob-smacked on the issues they cite as reasons to vote for their candidate! Remember, Labour ran the council for TEN years until THREE years ago. 1) They say Hove needs a new school. OK, so when should plans been put in place for that? Kids aren't born at school age... there is plenty of notice on how many school places will be needed - it is LABOUR who failed to plan in the first place! OK the conservative administration that followed them should have caught up - especially as the Westbourne ward had two conservative councillors representing it! Thats a Labour and Conservative fail right there. 2) They say a £200 council tax rise (3.5%) is too high and will hit struggling households. OK, so what was the average council tax increase while Labour were in charge? Looks around 9% to me... and that was when inflation was around 2%! 3) They say parking charges strangle business. It made a profit of £7.4 million That amount was a £1.2 million leap from the £6.2 million and £13.9 million income generated in 2007/8. They seem to be saying "Vote Labour, because the Greens are doing what Labour were already doing." The council only exists to serve the residents - make me your man on the inside. The council only exists to serve the residents. Even the big businesses like American Express are only of benefit to Brighton and hove in as far as they benefit the residents (with jobs, inward investment, bringing in wealth, business and supporting better facilities). The council has (and finances) many 'partnership' organisation - collections of organisations being consulted on policy. How many residents are a member of even one of these organisations? I am not a member of any - I expect (and other residents should expect) to be able to speak to the council directly.I further suspect that many of these 'partnership' organisations are manned by the same people over and over - giving residents no voice, and unaccountable 'representatives' several voices. These partnerships must be properly reviewed. I am not (yet) a councillor, I don't have time to examine everything the council does, but every time I look at what the council is doing or a council document I see masses of improvement and efficiencies that can be made! If this is typical then there is huge scope to make savings in the cost of the council operation and improve the service offered to residents - often simply by making the council properly and directly accountable to the residents so silly pet projects can be ditched before they even start! Brighton and Hove - It isn't just Pavilion! Transport and Shopping. The Council persist in planning and operating as if the City is just Brighton Pavilion. This shows especially in transport policy - the city has been described as ideal for alternative transport such as walking and cycling. This may be true of central Brighton, but further out there is not only simple distance to consider, but the substantial hills of the downs. Mass public transport is not an adequate replacement for personal transportation. Even in central Brighton it is a brave person who would leave their bicycle parked and unsupervised. Residents deserve special treatment by their own council, to access the facilities of the city. Some free parking - especially for those furthest from the centre - whether on a specific day, with residents 'vouchers', or a dedicated (pre-bookable) residents car park (the Laines car park has a 'private' entrance and could be considered). Once people get out of the habit of shopping in the city - going elsewhere, or even shopping on line, it will be far harder (if not impossible) to entice them back. The council lose income, businesses lose income and residents lose facilities that make the city such a great place to be. There are tough financial times ahead, and with more and more closed shops boarded up in the centre of Brighton already we need to boost trade before the decline becomes permanent. Brighton and Hove - Housing - Not failing to plan, but actually planning to fail. Just last month Brighton and Hove council had a report that Brighton and Hove will need 16 to 20 thousand new homes by 2030 - so they are recommending the building of only 11 thousand (at least 5000 short!). Either the council do not trust the original estimate - in which case they need to explain why and have another (trustworthy) one done or they need to explain why they are deliberately planning to leave Brighton and Hove (and a future council) short of between 5,000 and 9,000 homes. In the same document they recommend arbitrarily restricting the the increase in 'houses of multiple occupancy' (HMO's)- which would prevent many existing properties being more efficiently used. Coucnil Tax rise below inflation? No, 100% over Inflation - its doubled. It shows how much above inflation council tax has risen over the past decade and a bit. In the budget document this is included to used to support an argument that a 3.5% increase is 'fair' because it is below inflation, when many past increases have be far, far higher than inflation. However, there are several issues here - firstly the reason the council are going for 3.5% is not because they want 3.5%. They are asking for 3.5% because that is the most they can ask for with out triggering a local referendum - and they know full well that they would lose that referendum. I am quite sure that the Greens would ask for 10% of 15% increases as labour did in the early 2000's if they could get away with it! Shows the net effect of the increases against inflation over the past decade. Right now council tax payers are paying almost twice as much now as they should be according to inflation. The council raise around £60,000,000 (sixty million pounds) more than they would if rises had been restricted to inflation. So what do we get for that £60,000,000? How did we get by ten years ago with out that money being taken from us and spent by the council? I am sure every taxpayer would be happy to have that extra £400 a year back - to spend as they see fit, maybe with local businesses, maybe on local charities, maybe just to heat their homes over winter - whatever they, as individuals, have as their own, personal priorities. What is the justification for not giving back what was taken, without explanation? I was delighted to read in todays Sunday Times that Esther Rantzen is starting a help line for older people 'Silverline'. A service working in a simliar way to 'Childline' the childrens service that she created some time ago, and appears to be going from strength to strength. Older people requiring care have always been vulnerable, but now with ever more older people requiring care and ever less control over who provides the care the situation needs urgent attention. Well what ever promoted the creation of 'Silverline' - I think it is a fantastic cause that deserves support. Brighton and Hove Budget - Part 2 - New Projects, 'spare money' - Greens break their #1 manifesto pledge. Resist, to the greatest extent possible, the service cuts and privatisation imposed on local councils by the Conservative and Lib Dem Government. 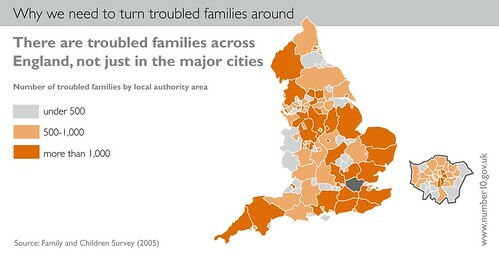 Where the Coalition leaves no choice, protect services for children, vulnerable adults and those on low incomes. Having detailed all their cuts, the Greens say they have some spare money available for new projects - new projects that they then set out. But if the cuts mean they have money left over, this surely simply means they have chosen to make more cuts than they needed to. The Greens may believe that their new projects are more important than the items they have cut, but that doesn't change the fact that they have made cuts that they did not need to make. So the Greens have deliberately acted against what they said was their number 1 priority in their manifesto. So much for the Greens 'fresh start for a fair city'. Brighton and Hove Budget - Part 1 - Toilets and Libraries. Clean, usable, public toilets are an essential part of the infrastructure for any city that wants people to access it using public transport and to travel on foot. They are also an essential facility outside the urban area where tourists, and parents with children maybe caught short. Toilets in public areas are open to abuse. Hence many retail outlets now restrict use of their toilets with access-codes and the like. Also, while shops already have staff on hand to look after them, public toilets generally do not have this benefit so require dedicated staff to be employed if they are to be supervised. Acting as an attendant to a public toilet, simply to ensure that it is kept clean and call on the police if there is any disturbance is not an arduous task, and I am sure there are many people who would be prepared to take on the role as a public service and for 'pin money'. Libraries - especially Mobile Libraries - should be considered as an essential part of the councils infrastructure in communicating with the public. Libraries should be considered one of the Councils primary public faces in communicating with the public, and part of the councils eyes and ears in recognising and listening to the public. Brighton and Hove council - especially the Greens - persist in thinking of the city as purely the central urban area. Access to the central facilities of the city is not good for people living further out, and with the councils attacks on car owners that access is being made worse and more expensive. Losing mobile libraries is just an other indication of this blinkered thinking. The council should add value to the use of libraries - it should look at cutting advertising/publication in the commercial press, and issuing a free-sheet of such notices that the public can obtain on paper from libraries, or on-line. 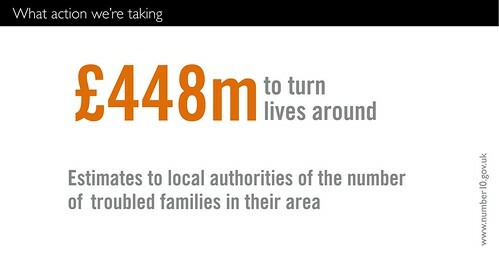 Access to other council facilities through libraries should also be considered - whether directly, or using public access computers in libraries with print-on-demand. In respect of Libraries it is for the council to use them or we, the public, will lose them. David Cameron has no genuine commitment to making parliament and MP's more accountable to the public. In principle, recall should be available to all electorates on demand. At any time, a petition by a proportion of the electorate should trigger a new election - simples. David Cameron has suggest a process that he has labelled 'recall', but gives the electorate no additional influence, control at all! Offence: Who decides what is 'significant' or not? How about betraying a manifest pledge? Yes/No? Censure: What if parliament decide no censure requried (maybe a minister already resigned)? When would parliament *EVER* admit it had not done enough and must defer to the people?!? Election: Yes, I'll accept that too.